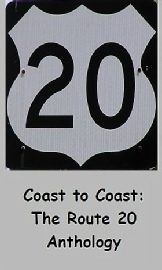 This collection of poems is a paean to route 20. It’s also a tribute to all blue highways everywhere, the historic roads that let us explore the country and its people at a pace of our own choosing. These roads are the home of the idiosyncratic and marvelous—the people and places that make travel by car such a rewarding choice over other modes of travel. To choose these roads is to declare that the journey is as important as the destination. A genuine road trip involves more than merely driving cross-country fixated on an end point. A genuine road trip acknowledges that the road itself and the people and places along the way are worthy sources of interest and wonder. The choice always there: Blue highway or Interstate. Big chain motel or independent. You can choose the predictable and know what you’ll get, but you’ll never know what you’re missing. 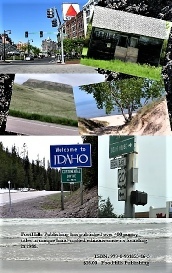 U.S. 20. at a length of 3,365 miles, is the longest road in America, coursing through twelve different states. Starting from Boston, Route 20 traverses the northern third of the country, through a varied American landscape: rolling hills of New York State; mid-America farmland and villages; sprawling, bustling Chicago; Mississippi and Missouri rivers; Nebraska sandhills; Wyoming plateau country; Yellowstone National Park; lava fields; high desert; Cascade Mountains and finally, the Pacific. I have made the complete journey from Boston to Newport two times and have spent many hours and traveled many miles on segments of it over the last five decades. It is always an enjoyable drive that continually offers something new to be noticed. If you’re up for a little blue highway trip of your own, Route 20 will not disappoint. To order by mail click here.